Something to cover your workspace. Don’t mind the tube of puffy paint. I had an idea for a design using it, but it bombed. I picked up my plants and cactus soil (specially formulated for proper drainage) at Mission Hills Nursery, a wonderful local shop with a knowledgeable staff. If you’re not in San Diego, I recommend you support your local nursery! Small businesses, all the way. 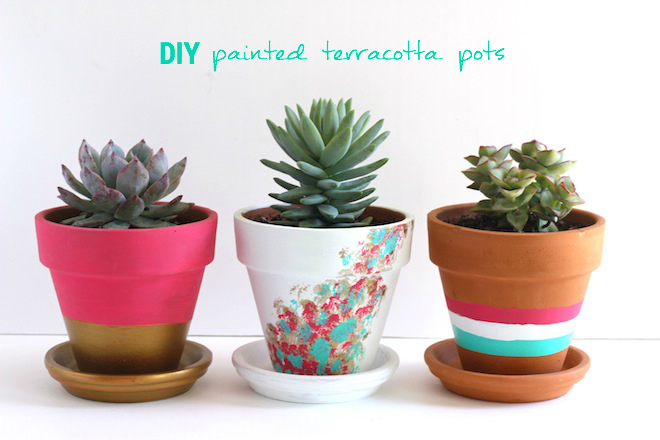 Now, I’ve seen different theories on painting terracotta pots. 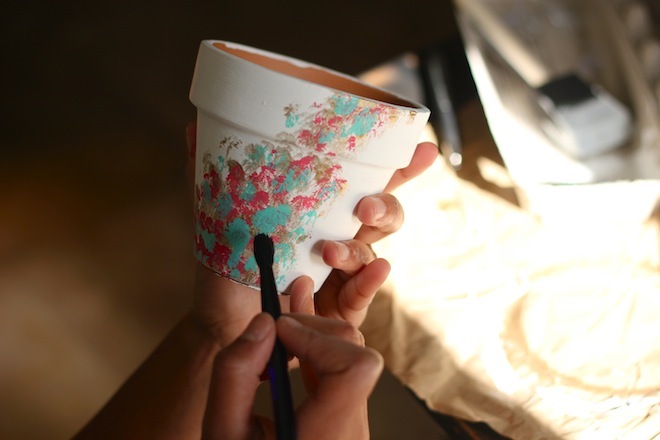 This how-to from SF Gate is quite comprehensive, and involves bleaching the inside of the pot and sealing the outside with a terracotta sealer. 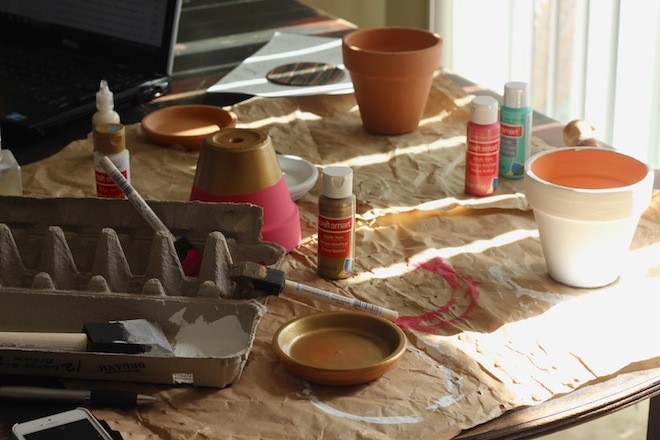 Then, there are other people (ahem, bloggers, ahem) who just slap some non-toxic paint on the pots and call it a day. My method is the latter. (Sorry, I’m not sorry.) Since my plants will be indoors without much direct sunlight, I didn’t bother with the extra steps. But if yours will be outside, you might want to try the Gate‘s version to protect the pots. How did I decide on the patterns? I love the simplicity of color-blocking, so that was definitely going to be one pot. 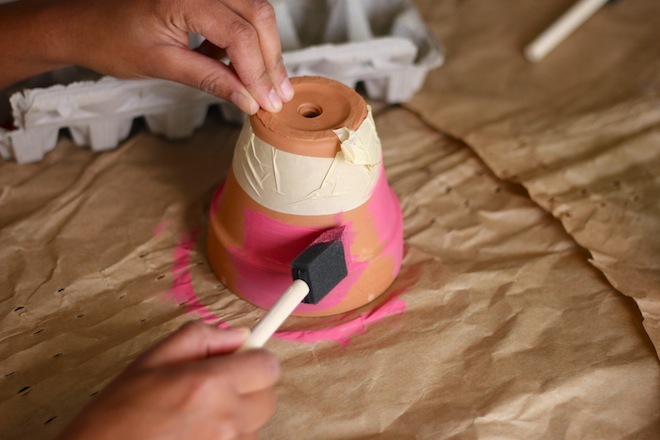 Masking tape made the color split a cinch, but wrapping tape around a conical pot in one straight line is hard. My line wasn’t 100% even, but I prefer the imperfection. I pulled inspiration for the splotch print from this Etsy find. It’s my favorite pot of the trio. It also happened to be the easiest to make. No tricky masking tape, no need for accuracy. And I’m happy that my Estée Lauder brush was finally put to good use. I wanted one pot to show a little terracotta color in its natural glory. The triple stripe pot, hiding in the back left, was a way to do that and incorporate almost all the colors. I also liked how it felt sporty, like an Adidas track suit. That said, trying to get those lines straight was a mother. I basically just used masking tape for the bottom lines and eyed the top line of each stripe myself. Some portions were more successful than others. All in all, I’m so happy with the project, which totaled about $50. I found the painting process extremely soothing, and what I’m left with is an awesome piece of homemade art. 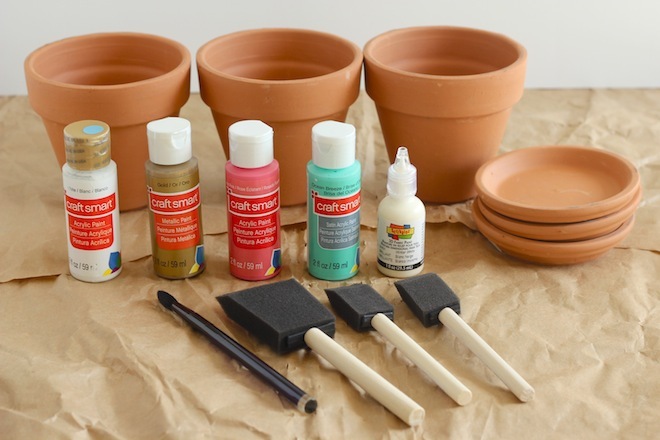 If you’re a friend or family member, you may see some DIY pots in your future. They make lovely gifts. 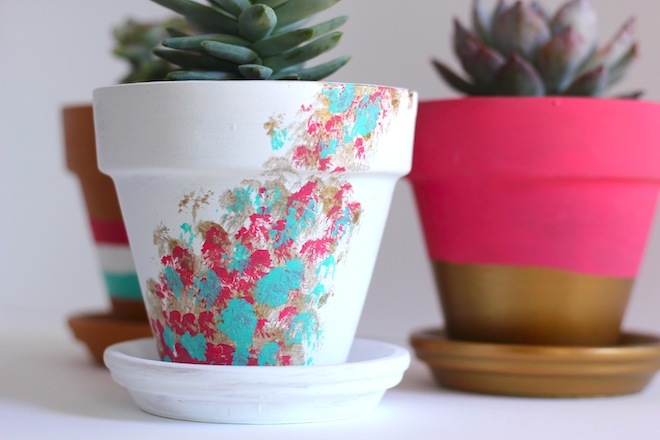 And if you’re into the DIY part and less enthusiastic about plants, this craft idea might be right up your alley. Happy painting! Hi Daisy! I went the lazy route and didn’t seal it, but if you check out the SF Gate’s more thorough article on painting terracotta — I linked to it in my post — that should help, as they suggest a dealer. Good luck! Thanks for reading! These are gorgeous. I saw something similar on @babyboybakery’s blog. I think you’ve inspired me! I’m gonna try it. Loved your tutorial! 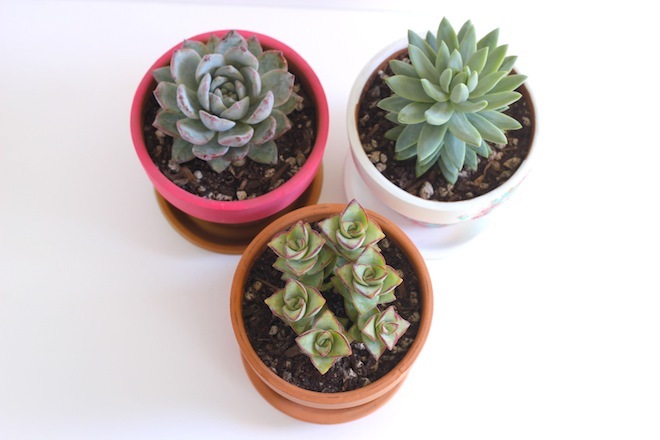 Just wanted to let you know I featured this DIY on my blog today! Thanks, Taryn! What a lovely round-up.